The cave temple dedicated to Gangadhareshwara in Gavipuram of Basavanagudi in the heart of the city of Bangalore is a unique structure of great antiquity. The original shrine carved within a cave of rock has a door thirty feet wide and about seven feet in height. In front of this were built a mandapa and a sikhara during the period of Kempegowda of Bangalore. 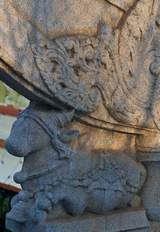 More important are the monolithic sculptures of trisula (trident), damaru (drum) and chatri (umbrella). They are of huge dimensions and hence prominently visible. The cave has two garbhagrihas, one dedicated to Siva and the other one is for Durga, at the right side. Both are apsidal in nature. Gangadhareshwara shrine has a sukhanasi and before it is a nandi. Both the linga and the nandi are carved out of the rock. The shrine of Durga has no sukhanasi and before the shrine are two pillars on both sides. Both shrines have separate pradakshinapatha. At the right side of the Durga temple is a square shrine which has no image now. On the right are two more small caves. The walls are built of bricks of the later period. However, in the interior are carved pillars to support the roof. From the outside, the Gangadhareshwara shrine has a fine circular sikhara which has carvings as well as niches with pilaster like decorations over which is a circular pot-like kalasha. The Surya shrine has a vimana of eight sides. Both these are stucco creations of the period of Kempegowda, the founder of Bangalore. This temple has some fine sculptures too. Durga shrine has a four feet high Lakshmi sculpture with four hands. 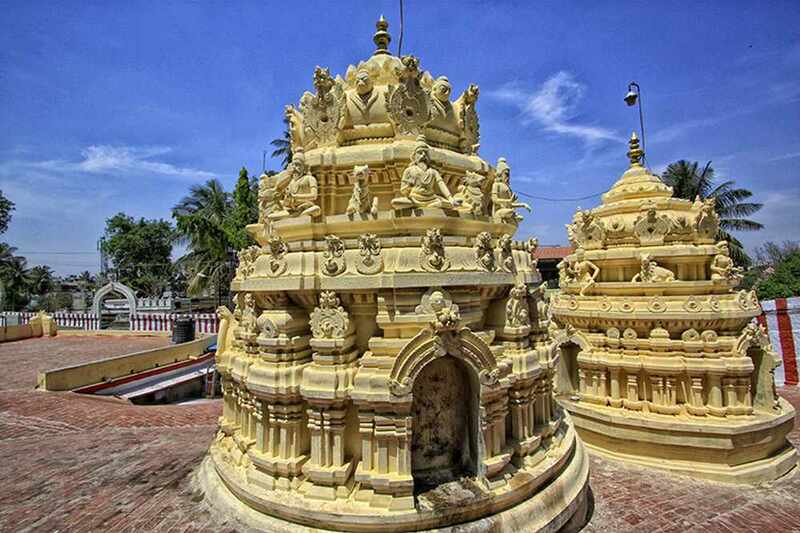 The sculptures of Bhairava, Dakshinamurti, Saptamatrikas have been kept inside the temple. Some of them may date back to eleventh century A.D., of the Chola period. There is no evidence like inscription to date the Gangadhareshwara temple. However, on the basis of stylistic evidence, the earliest part of the temple may be dated to the Chola or Ganga period during the eleventh century A.D. The subsequent additions of the mandapa, sikharas and monolithic sculptures were made during the period of Kempegowda in the seventeenth century A.D.
Because of the cave architecture, this temple is unique in the history of art at Bangalore.